Includes: Expert pro-guide, private jet boat, all bait and tackle and gourmet riverside lunch (hearty sandwiches, baked goods, fruit, snacks and bottled water). The largest we generally hook are over 1000 lbs, around 11 ft long with a 6 ft girth! 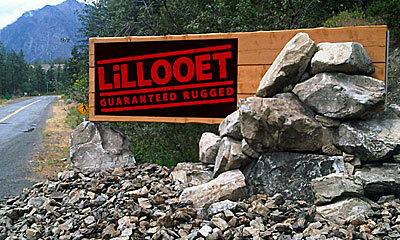 Out Of Country Anglers Please Call Toll Free 1-844-983-8224 Or Email For Pricing. All Prices Are Subject To 5% Canadian Goods & Services Tax (GST). From private one-person guided tours to corporate groups and large angler families, we can accomodate parties of all sizes. Our pro’s know the most reliable spots and when to hit them, guaranteeing Monster Results! Each of our experienced Fraser River sturgeon fishing guides are licensed and insured with over 10 years on the water, supplying high-quality tackle and bait for each passenger on your excursion. Under British Columbia law, each angler fisherman is required to have a valid fishing license and follow safe handling practices during catch and release of these great fish. Please ensure that you have a valid personal license and have watched the video and read the documentation on our homepage before booking. 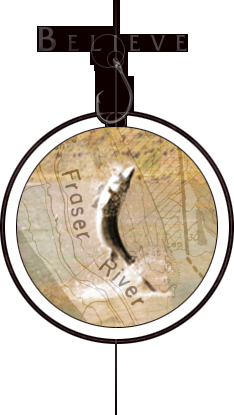 River Monster Adventures is proud to be part of the Fraser River Conservation Society. We scan, tag and document all fish landed for the provincial fishery records. Epic. Legendary. Unbelievable. It’s the most incredible fish story imaginable. Wage a battle with North America’s largest freshwater predator on your own pro-angling tour through the heart of British Columbia’s dense interior. 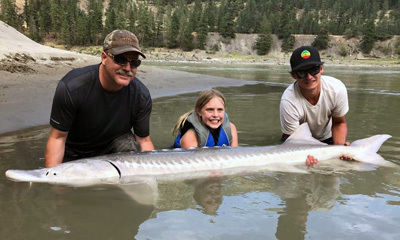 Operating in Fraser River Canyon, the very same river that four separate instances of World Record sized-fish were captured in the past two years, it’s only the biggest game on the water when you’re hunting these extremely-active 1 ton tail-walkers, quite possibly the largest river fish on this side of the planet. Be the hero of your own saga this summer and land a monster trophy in just a single day with our pro-guides or why not book a weekend trip and catch more than one! Anyone can do it with our assistance, from children to older anglers to actual first timers on the water. Just be sure to bring a camera because this indescribable fishing experience is something that has to been seen to be believed. Our jetboats will quickly take us to location each morning where we’ll set up camp at one of several exclusive prime hotspots where giant Sturgeon lay and feed along the shoreline. Fishing directly from the boat, we have the room to stretch and relax when necessary, move around and most importantly, the reliable footing and support you need when landing a monster. This very remote and relaxed setting is one of the most enjoyable extreme angling tours you can imagine, casting near idyllic hot sandy beaches that wind along a cool river canyon. Truly Mother Nature at her best! For those accompanying but not fishing full-time during the journey, there’s ample terrain to explore and plenty of wildlife to spot, even natural gold-panning for those looking for a different kind of trophy. 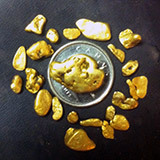 Short prospecting tours are easily possible and you can keep any gold you find! You’ll be right in the wild with bighorn sheep, deer, mountain goats, black bears, bald eagles and more sharing the canyon with us. Connect with nature right on the beach and get some Vitamin D! Our jetboats will quickly take us to location each morning where we’ll set up camp at one of several exclusive prime hotspots where giant Sturgeon lay and feed along the shoreline. Fishing directly from the boat, it gives us room to stretch and relax when necessary, move around and most importantly, the reliable footing and support you need when landing a monster. This very remote and relaxed setting is one of the most enjoyable extreme angling tours you can imagine, casting near idyllic hot sandy beaches that wind along a cool river canyon. Truly Mother Nature at her best! 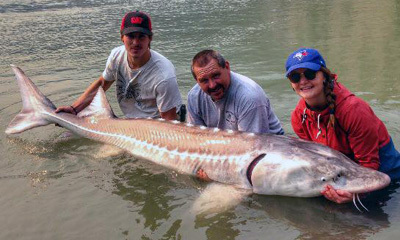 Wondering why Sturgeon Fishing has become so popular lately? 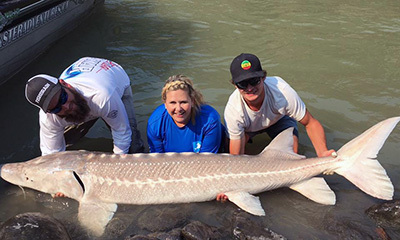 Learn more about this giant prehistoric-type predator and why it’s one of the most exciting river fishing experiences imaginable. Make it a monster fishing weekend and stay overnight at one of the many hotels and campgrounds near-by. Drop our Pro’s a line today and get ready for the angling adventure of a lifetime.